Earlier, I wrote a piece, a list of 28 lessons that I had taken away from Ohio State and I wanted to end with the biggest thing I will take away from college, from the years 2013-2017. After writing it, I decided that number 29, deserved more space than a list of one-liners could give. #29 is embodied the picture above. 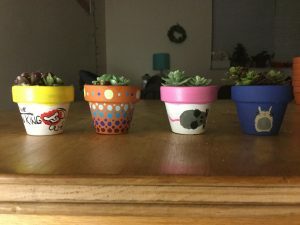 Each of these pots is a friend, two I met freshmen year, one in sophomore summer, and one in junior year. Each one is precious to me. At a crafting/game night, I asked if they could paint something for me that signified our friendship, either how we met, or what we will remember about each other. For the yellow, I will remember taking my first MUNDO trip, a trip I now consider my first “college experience,” to see the Lion King and being worried about knowing no one. I will remember getting early to the bus circle and sitting by a stranger, and talking for hours on the bus there, at Wendy’s, on the way back from Pittsburgh. We tried to rock-climb half a dozen times first semester but would never remember to check the climbing schedule; we went together to our first Party at the Wex and found art that affected us and art where our attempt at interpretations made us laugh. She was the reason I switched my major to Neuroscience, the friend who would meet me in Lincoln’s lobby to talk barefoot at all the odd hours and the girl whose friendship and light continually inspired me to push through first year. For the polka dots, I will remember seeing a girl set up her Doctor Who poster on the bottom bunk, and on the first day, recognizing pieces of my sister in my new roommate. I will remember afternoons studying side by side and being happily distracted by watching OUaT over her shoulder; I will remember her teasing at my daily and greasy to-go bags from Mirror Lake Creamery and my responding quips about her extremely colorful RPAC meals. She stayed up late to give me “The Talk,” complete with pictures and recommendations to Youtube videos, applied to Mirrors and eventually Sphinx Honorary with me and always served as my anchor in a sea of overwhelming newness. She was the recipient of my finals week Cheryl’s cookies boxes, an example of unabashed pride in what she loves and a mothering influence that give me my first family at OSU. For the pink pot, I will remember unexpected meeting a girl in my lab one summer and finding out she was going to be my research partner. I will remember discovering that she was one of the girls’ who got the house my roommates and I were trying to lease the fall before, I will remember opening up to her early on for advice. We muddled through research together, learning how to present, perform behavioral assays and pretend like we knew what we were doing even when we didn’t. She taught me to how to recognize sarcasm (most of the time), exposed me to more Harry Potter trivia than I will ever need to know, and her courage in admitting pre-med wasn’t her life path and switching to her true passion gave me the courage to do the same. For the blue pot, I will remember being flustered when a student introduced himself to me by formally shaking my hand and worrying that I didn’t have a proper business handshake. I will remember him giving me a safe space to talk about vulnerable parts of myself that I didn’t always acknowledge, I will remember his playful shock at my music taste when we exchanged playlists and my own surprise at what was on his. We unwound outside of class, spending time watching movies, playing Truth or Dare, learning how to box, play chess and quill. He let me cut his hair on a dare, cooks and crafts with me regularly, whether the project is Filipino food or sewing neck pillows, and is an unwavering pillar of support and kindness. 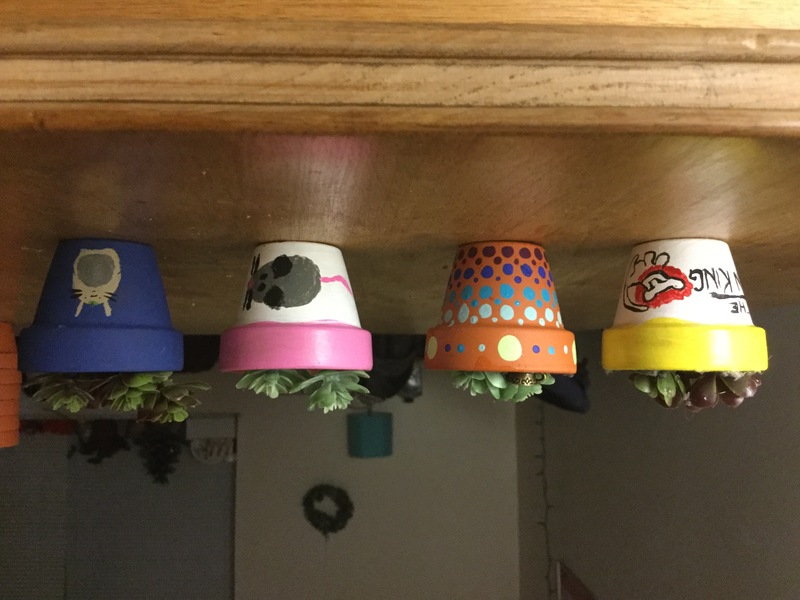 These pots are just four of the friends I have made—I still need to rope everyone else into painting a pot with me. But my friends—their stories, our connections—are the most valuable thing I will take away from 2013-2017. I have been told: surround yourself with excellence. I didn’t set out to do that, but in the process of making friends and family, I have found the most excellent people that I could ever imagine to find and I am blessed to have them. Posted by sucaldito.3 at 4:45pm Posted in Artifacts. Bookmark the permalink.